Howdy Y’all! I’ve been quite busy with my food cart these past couple of weeks, and have enjoyed some great successes, including catering a wedding party, and a back-to-back First Friday Art Walk and Saturday morning Farmer’s Market. I have had so much fun meeting all the people who visit me and order my tacos, but it certainly doesn’t leave me a lot of time for blogging and cooking for my own family. 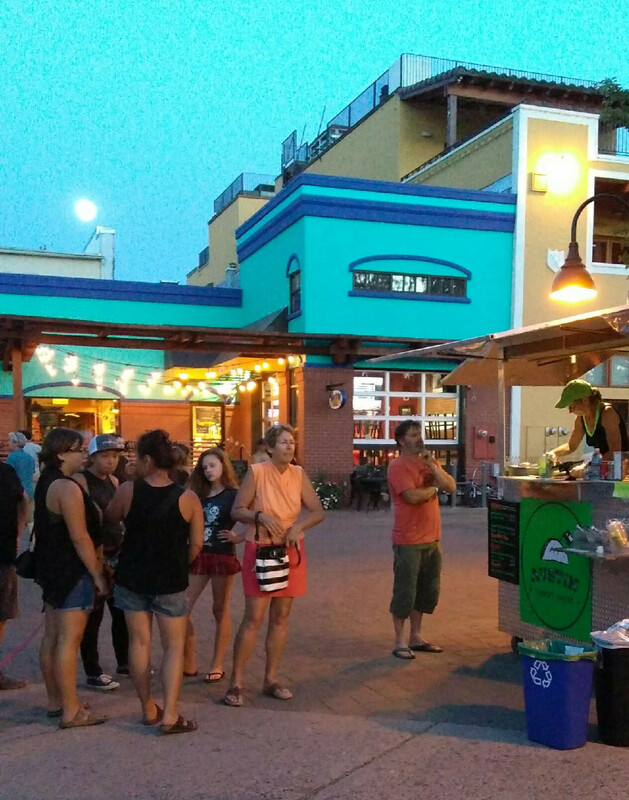 Here is a photo my husband took during First Friday of me slinging tacos to the hungry folks. There were hundreds of people gathered in the courtyard who enjoyed square-dancing to music by a great folk band. The kiddos were having a blast! Since we are in the throes of summer-time heat, I thought I’d reblog a recipe of mine from a couple of years ago. It sure sounds perfect for tonight’s meal! Enjoy! Grilling season is my favorite time of the year! OK, maybe tied with soup season. But when it’s hot out, I love grilling every night. The kitchen doesn’t get hot, and it’s always easy clean up! I marinated some chicken today in Greek seasonings, sliced up some veggies, skewered the heck out of them, then slapped them on the grill. A couple of turns later, well, it’s dinner time on the deck! I wanted to serve this with rice, but hubby said he wanted potatoes. So I compromised and cooked pasta with herbs instead, HA! I hope you enjoy this simple summer dinner. Cut the chicken into uniform chunks, about a half-inch in width/height. Prep all your veggies and keep cool, if needed. In a small glass bowl, add the lemon juice, garlic, yogurt, 1 tablespoon of the olive oil, minced oregano, and ground black pepper. Whisk until smooth and completely blended. Pour 3/4 of the marinade over the chicken in a quart zip-top/lock baggie and add the chicken and squish around until covered. Refrigerate for at least one hour or up to three. 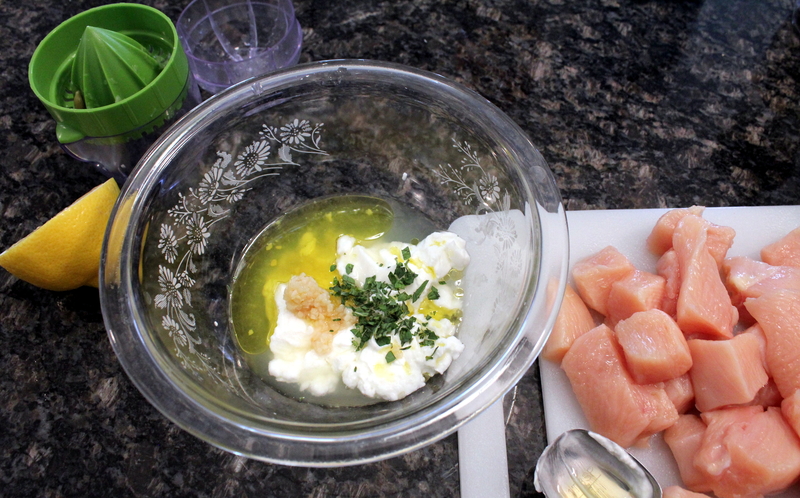 Add 2 more tablespoons of olive oil to the remaining marinade and whisk until smooth again and refrigerate. This will be used for your veggies. 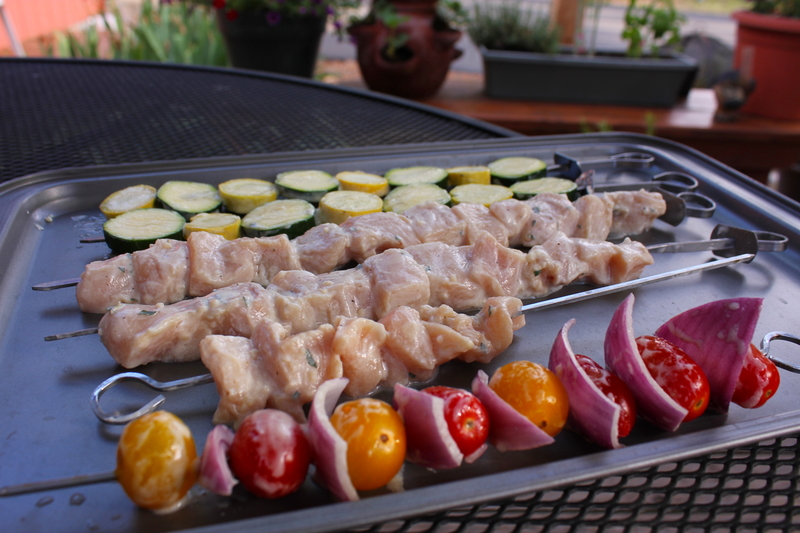 After the chicken is done marinating (about 45 minutes before you want to eat), skewer the chicken and veggies, in any combination you want and place on a large baking tray. I used sliced squash, zucchini, red onion, and cherry and grape tomatoes, but really you can use any vegetables that you want. Brush the remaining marinade over the veggies on all sides. Place skewers on the grill, and cook for about 10 minutes on each side, flipping once halfway through the cooking time. Depending on the shape of your chicken, you might have to do quarter-turn flips. Remove from grill and place on tray and cover with foil for a few minutes. We served this with pasta, but you could also do rice or potatoes. Just time your cooking of that side accordingly with this, OR just eat lots of chicken and veggies! Enjoy! So thrilled your food cart is a success. You must be so busy. Are you doing this year round? It’s such a great idea and I can imagine how delicious those tacos are. Your Kebab sounds fantastic as well, perfect summer meal!! I’m not sure what I’ll do when the snow flies. I need to work on some catering media, I believe. 🙂 Thanks Suzanne! Nice to hear that you’re still having fun with the cart, Kathryn. Is that a line, I see? Yay. Thanks for the recipe. I love kabobs and enjoy trying different marinades (besides teriyaki, teriyaki and, um, teriyaki). Ha ha. Congratulations. hose kebabs would go down well on the food cart too! They sure would Mad Dog! Thanks! Thank you Michelle, they sure are! That’s so cool that your food cart is doing well. Those kebabs would be a hit also. Thank you so much Gerlinde! I’m sure they would! Yum and so happy to hear of your success!!!!! Great to hear you’re doing well with the food cart! Thank you so much Stefan! 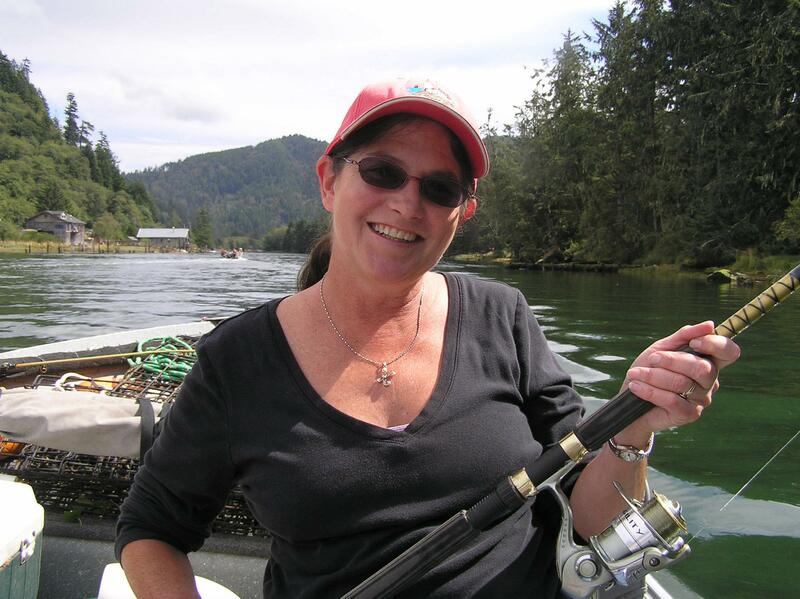 Your travels look like a lot of fun and food! Hi Kathryn! These look amazing. I am so in love with Greek food! Have a good week! Thank you Debbie, I hope you have a good one too! Indeed, this post is well worth a “second helping.” Yum! Oh PS: I just finished writing “Pepper Stargazer” into episode 3. You won’t see it for a couple of weeks. More hugs. Thank you my dear friend! Mega hugs back! Thank you so much Josette, I do appreciate the support! Oh, I’m making these for sure!! I love those Greek flavors and kabobs would be so great tonight! 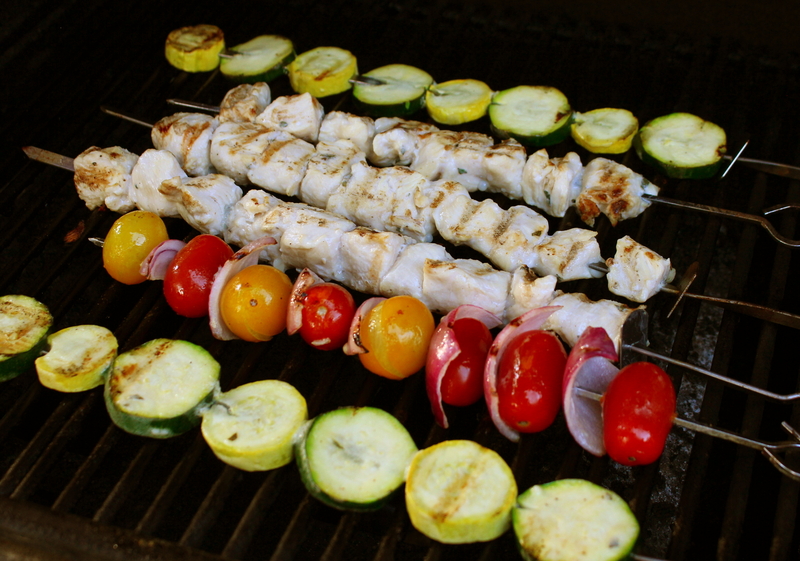 I like that you did different skewers for the veg and chicken – it makes it so much easier to cook. Thanks Mollie!!! The kabobs are delicious. In fact, I just might make these again tonight, they are calling my name. Glad to know your food cart is doing well! Congrats Kathryn 🙂 These kabobs looks very tempting! Thank you Freda! I made them again a couple of nights ago. So easy! Great to hear on your success. Kebabs looks fabulous and delicious. Best wishes Kath. Thank you so much Sumith! This looks yummy. I love Gr keep food. How is the food truck business going? Love the pic. 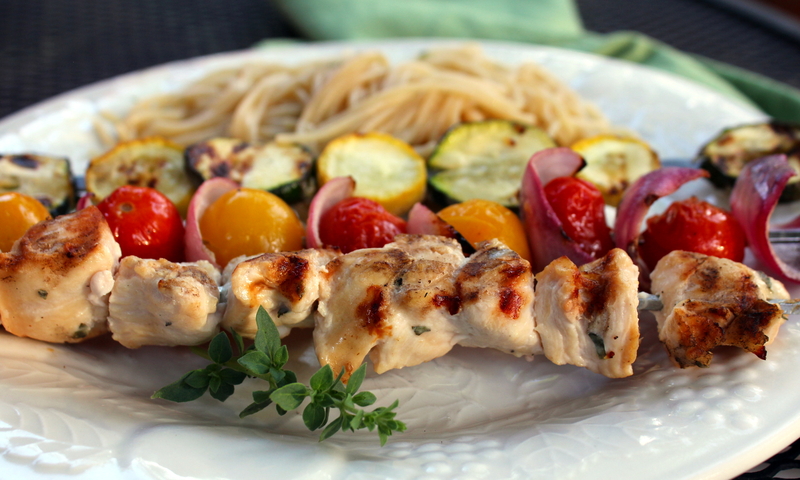 These kebabs sound delicious and are so perfect for the summer! Thank you Brina, they certainly are! That’s awesome you’re running your own food cart business, must be a ton of busy fun. This looks like a delicious recipe that I must try. Thank you so much! Yes, it’s quite time-consuming but I do love it! The people I meet are great, too!